iPad with added cash drawer, printers, and scanners. Click image to watch video. The choice actually just got easier because VendHQ just announced integration with PayPal which means anyone can immediately get started selling online or off without having to acquire their own merchant account. Safari browsers: your existing desktop, laptop, iPad. An iPad is the perfect portable device to use anywhere. Carry it to a tradeshow or event. Sell from additional venues. Or connect it to a cash drawer and use it at a checkout counter. The Vend dashboard allows you to instantly see live sales by product in graph form for one or more locations. “Painless” inventory management with set automatic reordering points. Export data to CSV or Xero accounting programs. Run your own in-house customer loyalty program. If you are a small business or have irregular sales volume, going with PayPal is the simplest solution. You don’t have to apply for a merchant account and wait for credit check and approval. There are no monthly maintenance costs. And most importantly, you receive the money into your PayPal account immediately. Similar to accepting credit cards, you pay a small percentage on each sale which varies depending on where you are located. The percentage charged on merchant accounts can be less expensive, but there is a monthly overhead cost you must pay whether you generate sales or not. If you decide to get a merchant account, be sure to read the fine print and understand all the fees. If you already have a merchant account you can use it with Vend. You can even integrate your existing ecommerce store on BigCommerce, Shopify, Etsy, Amazon, Storenvy, PayPal, ShipStation, and more. See the Vend HQ POS System Buyer’s Guide to pick the right POS system for you plus answers to commonly asked questions. 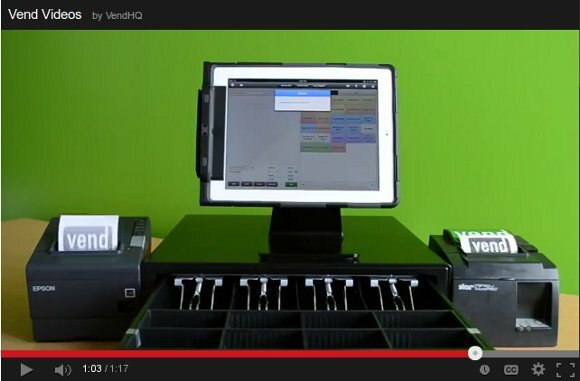 Or go with the Vend iPad PayPal POS system. Try it free for 30 days or the rest of 2013. Plans starting at only $35 per month. 8,000+ stores worldwide are already using Vend. I have not come across a faster, easier, or less expensive way to accept payments for your business. Me too, Paypal is safe and still the best when it comes to money transaction. I think Paypal is a good solution for online sale and purchase business, but it is not available in Pakistan. Some of the online sellers from Pakistan have moved to other countries where Paypal is available. Hence i would like to request Paypal to start their services in Pakistan, as all the banks have adopted the IBAN System. It is unfortunate that some countries are unable to use systems like PayPal. Pakistan is not the only country PayPal chooses not to operate in. That’s really amazing POS system. This is definitely works than other POS systems. Thanks Gail for sharing about this Vend POS system. This is amazing, I mean it has now become easy for new entrepreneur. Exporting data, keeping eye on live sales, appointment scheduling, these services surely will make tasks easy and less time consuming. Does this mean we’ll be able to use PayPal on amazon? No, it doesn’t. However, if you have a PayPal account that is more than two months old you can apply for a debit card that you can use to check out at Amazon. Thanks for this wonderful post.,I really love PayPal,and these is yet another reason I’ll be using it. I’ve signed up for the 30 Day trial. I’ll surely buy it if I like it. Vend’s system would save small businesses a lot of time if they use all the features and integrate it with their accounting and eCommerce solutions. Be sure to check out the Vend Product Add-Ons”>.